The actions of the Saudi royal family have been raising eyebrows around the world recently. The use of the death penalty against a group of dissidents, including the execution of the well-known Shiite cleric Nimr al-Nimr, was a gauntlet thrown in the face of Iran as well as other countries. Even official Washington, which tolerates worse offenses than that from its loyal allies, has had to speak up. Riyadh is coming unglued because the plan to overthrow that «bloody dictator» Bashar al-Assad is foundering, and Iran and Hezbollah are part of the reason why. Not only are they helping to defeat Daesh, but the Tehran-backed Houthis are also racking up big military victories in Yemen. The Alawites in Syria, the Houthis in Yemen… the Kingdom of Saudi Arabia (KSA) is feeling squeezed from two sides. In response to all these challenges, the royal family apparently decided to ignite a religious war between Sunnis and Shiites that would add a new dimension to the conflict in Syria. At the same time, they have been wagering on a flare-up of the historic feud between Arabs and Persians. Tehran, however, has thus far reacted with restraint. Ayatollah Khamenei has said only that Allah will punish Saudi Arabia’s wicked rulers for the blood of the righteous Shiite cleric Nimr al-Nimr. But the reaction on the streets of Tehran has been far more furious. The Saudi embassy in Iran was ransacked. In response, Saudi Arabia, Bahrain, the UAE, Sudan, and Somalia have severed or suspended diplomatic relations with Iran. Many today in Washington share these views. White House Press Secretary Josh Earnest has warned that the US would not be pressured by any country into enforcing economic sanctions against Iran. The implication is that if Washington introduces new sanctions against Iran, it will not be at the Saudis’ request, but under the pretext of opposing Iran’s program to develop new ballistic missiles. Judging by Tehran’s reaction, the Iranians will try to prevent the conflict with Riyadh from escalating into an open, armed confrontation. This is especially because levelheaded Iranian politicians can see that the kingdom is digging itself into a hole in Yemen. Last year, after Shiite rebels from the Ansar Allah movement forced Yemeni President Mansur Hadi to quit the capital and then flee to Saudi Arabia, some of Yemen’s government troops joined their side, bringing all their weapons with them, including Soviet-made R-17 («Scud») ballistic missiles. Currently the rebels control northwestern Yemen, including the capital city of Sanaa, and use their R-17 missiles to occasionally shell Saudi Arabia. Several rockets have been intercepted by Saudi air defenses, and some have fallen into the desert, but a few have hit their intended targets. In particular, during a rocket attack last June on the largest air base in Saudi Arabia, located in the southwestern province of Asir, the commander of the Royal Saudi Air Force, Lieutenant General Muhammad bin Ahmed al-Shaalan, was killed. In the same province, on the second day of the new year of 2016, Houthis successfully used Qaher-1 missiles (part of the arsenal of the pro-government Iraqi Shiite militia group Asa’ib Ahl al-Haq) to launch an attack on some important oil depots. This was reported to be the 11th missile launch by the Houthis in the last 20 days. Iranian sources also reported that in the final days of 2015 Yemeni rockets sank a Saudi warship in the waters near the Strait of Bab el-Mandeb. That was the ninth Saudi ship that Yemeni rebels have destroyed using missiles. Recently the Houthis have been subjecting the border provinces of Saudi Arabia (Jizan, Najran, and Asir) to increasing numbers of rocket attacks, and have also gone after Saudi troops in southern Yemen, in the provinces of Aden, Taiz, and Marib, which are controlled by the forces of the ousted Yemeni President Mansur Hadi. The Saudi troops’ superiority in arms is not apparent, as the rebels are fairly well equipped with Iranian-made weapons that were manufactured under Russian licenses. So, in addition to the Fagot anti-tank guided missiles they have long been known to possess, the insurgents also now have the Konkurs missile system, updated by the Iranians, which turns the Saudis’ new Abrams tanks into nothing but a mound of charred steel. 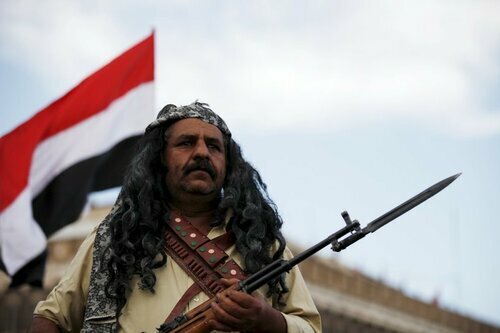 The main danger for Riyadh is that Yemeni forces could invade Saudi Arabia itself, in which case the ranks of the Shiite insurgency would quickly begin to swell, and the royal house would be faced with a civil war in its own living room, worse than the one it has inflicted on Syria.